The definition of black and white imagery. 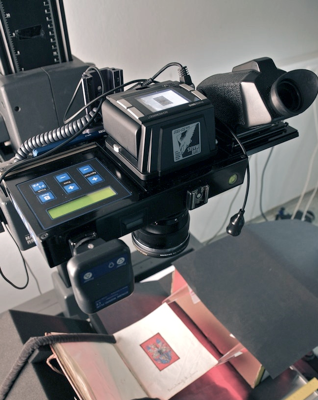 The Achromatic+ has been installed in scientific, preservation, archiving, aerial, fine art, and photogrammetry applications for close to a decade. It’s files have been used to analyze sub-atomic particles, agricultural crops from 11,000 feet, and hidden messages in historic and obscure books. The unique nature and versatility of the Achromatic+ means it’s well suited for a vast array of duties. 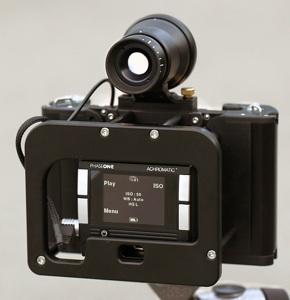 Many times, when we see an Achromatic+ in action, it’s mounted to a contraption similar to this. 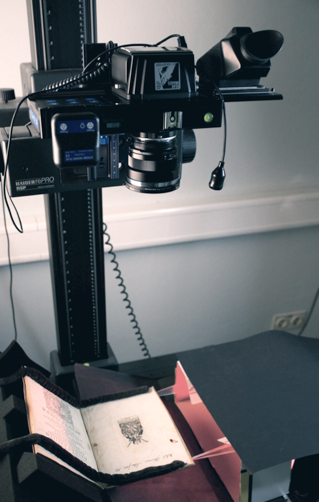 Because it’s often used for archiving & preservation, many Achromatic+ backs spend much of their time on copy stands. Any number of camera platforms can integrate into this configuration. Depending on the objectives of the installation, camera systems can be fully electronically controlled or manual. If perspective control is required, full view cameras may be mounted to camera stands just as easily. 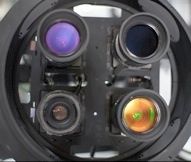 Alternatively, some applications require only that the focal plane remain completely parallel to the subject, in which case a simpler, precision-machined technical or custom camera platform may be more ideal. Whatever the application, the Achromatic+ is modular and versatile enough to adapt. 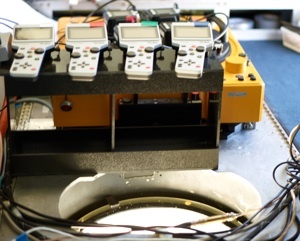 For a custom aerial survey installation, four Achromatic+ backs were fit into a custom “camera” and mounted into the observation hole in the belly of a plane. The leaf shutter lenses were then controlled by four electronic shutter controllers, and the entire system was patched into the navigation system of the aircraft. All four cameras capture simultaneously according to a predetermined flight path and shot list. Files may be stored to removable flash memory (CF card), or directly to a computer’s hard drive. In this particular application, each back/lens combination is filtered for a different wavelength of the spectrum. The resulting images are manipulated to display false color infrared, and are used to identify living foliage, agricultural crops, and even to assess the destruction caused by wild fire or other natural disasters. ©2010 Bear Images Photographic. Not to be reproduced without explicit permission from Bear Images Photographic, Inc. When used for scientific purposes, or any application in which ultimate precision and accuracy are required, the Alpa Metric camera may be the ideal solution. This camera system is available by special order only, as it is adapted and calibrated precisely to the end user’s needs and specifications. It is most commonly found in computer-supported measuring for industry, cartography, surveying, and many other technical applications. There are almost infinite possibilities of mounting, installation, and operational configurations, for more information on the Achromatic+ digital back, and how it may integrate into your specific application, please contact us. The only digital camera of its kind.